Garmin Edge 1000 is a cycling GPS with a 3-inch touchscreen. Full European mapping is provided including 34 countries. It includes cycle paths, elevation data, points of interest and address search. Mapping is stored on the Garmin device so you do not need to rely upon a smartphone connection. The Edge 1000 is bluetooth and WiFi compatible for downloading routes and cycling information. Activity profiles are available for different types of cycling including road, mountain and touring cycling. The battery life is 15 hours and it is waterproof to IPX7 standards. Accessories, spares and parts are still available for your Edge 1000. Garmin Edge 1000 is a Garmin cycling GPS that features a dual-orientation, 3-inch high-resolution colour touchscreen for navigation whilst cycling. The GPS Edge 1000 will help you navigate on-road and off-road and features a preloaded Garmin Cycle Map which includes Full Europe mapping for 34 countries including address search information. This cycling navigation device is ideal for touring and adventure biking. The Garmin Edge 1000 has been optimised for use on your cycling journey. It is waterproof to IPX7 standards. The battery life is up to 15 hours. You can change the brightness of the screen, which may be used to maximise battery power. The Garmin Edge 1000 provides routes to your destination. It includes cycle paths, elevation data, points of interest and address search. 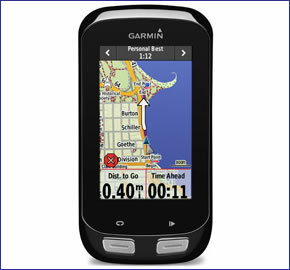 Mapping is stored on the Garmin device so you do not need to rely upon a smartphone connection. If you input a desired distance to cycle the Garmin Edge 1000 will calculate a choice of 3 round trips for you to cycle which you can choose from. You can also review the elevation details for each route. Should you go off-track the Edge 1000 can get you back on track or direct you back to the start of your journey. The Garmin Edge 1000 offers Connect features. You can receive incoming calls, text alerts , emails and view weather information. You are also able to send courses you have cycled and receive courses that you want to cycle. You can then compare you performance with other cyclists to see how fast you can cycle compared with cyclists that have cycled the same route. All this information is provided in real-time so you can compare your performance instantly as you are cycling. Live tracking is also possible allowing friends, family and followers to see where you are on a map. The Edge is also bluetooth and WiFi compatible so you can wirelessly upload and download routes and cycling information. Customise training pages include up to 10 data fields so you can see data relating to your cycling achievements instantly on screen. Activity profiles are available for different types of cycling including road, mountain and touring cycling. Using Garmin Connect you can plan, schedule and upload routes to your Garmin Edge 1000. The Edge 1000 includes a Barometric altimeter. It is also compatible with ANT+ sensors such as speed, cadence, heart rate and will work with compatible weight scale. Additional information includes the ability to display the gear you are in on screen (this feature only works with Shimano Di2 electronic shifting systems. Looking for accessories and spares for the Garmin Edge 1000? All parts are genuine Garmin product and specifically designed for use with the Garmin cycle GPS 1000 device. Discover the optional range of maps that you can add to the Garmin Edge 1000 here. Maps available include GB Discoverer Ordnance Survey (OS) mapping, Cycle Map Europe and and TOPO topographical mapping. Question: Hello, we have a Garmin Edge 1000 on our tandem and we are off to Turkey. Do you have a cycling map for Turkey that is compatible, on a SD card would be great so we can slot it in. Answer: Unfortunately not. The Garmin City Navigator map series used to be compatible with the Garmin Edge range. This was until Garmin released their latest 2018 version and the City Navigator maps was no longer compatible. We now sell Garmin Cycle maps for UK and Europe, however the coverage doesn't extend to Turkey. Garmin often grant licenses to companies within a set country e.g. Spain, to sell third party maps for use with their devices. There may or may not be a map available for your Garmin Edge 1000 from a Turkish company? An internet search would yield the results and answer. Question: I purchased a Garmin Edge 1000 in South Africa, which is preloaded with maps of South Africa and Namibia, exclusively for mountain biking and road cycling. Since I cycle in Europe a lot (especially France, Switzerland, Italy and Germany) I wish to purchase maps for my Garmin to cover also Western Europe. The maps that I viewed for this region are sold at about 500 US$, more than double than what I paid for my device. Is there a more reasonably priced map for this region, and if so, can I download it directly from the Garmin website to my Garmin, via my computer? And if this is possible, how do I do it? Answer: Buying from ActiveGPS you have the following option: Garmin TOPO maps - regional maps are available e.g. Germany which provide 1:25,000 topographic highly detailed maps for your Edge 1000. Question: Is the 1:50000 OS map that I use with my Garmin Edge 800 not compatible with the Edge 1000. I am assuming we can buy OS mapping for the Edge 1000. Answer: I can confirm that the Edge 1000 and Edge 800 take the same maps. If your mapping is on micro/SD card it can be used in either device but not both at the same time. You can view and buy Edge 1000 maps here. Do you have a question about the Garmin Edge 1000? Submit your question via our contact page.